If your looking for detailed information for previous races, look no further. 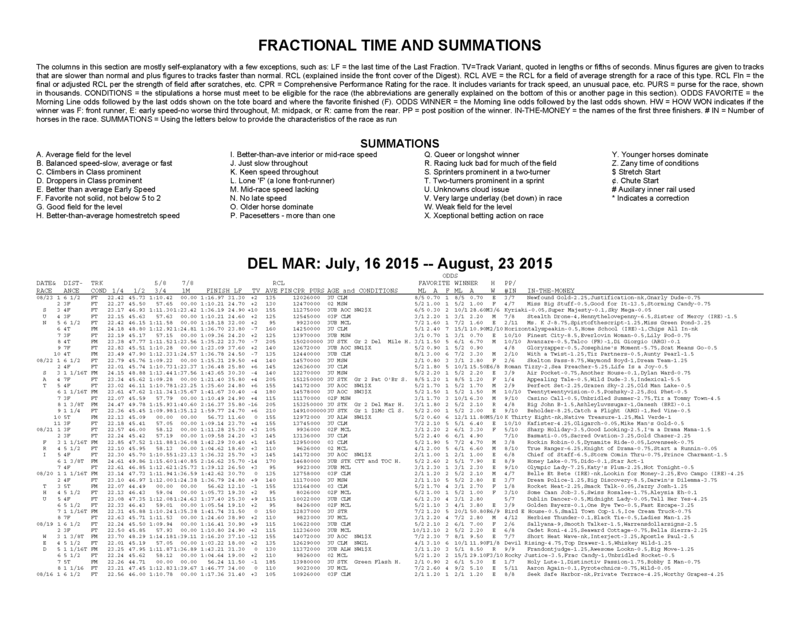 The Digest’s Fractional Times and Summations displays the distance, class, track conditions, Race Competition Level (RCL), purse, Comprehensive Performance Rating (CPR), morning line and actual odds of the winner, the winner’s running style, the first three finishers, and whether or not the race was fast, slow or average for each race. 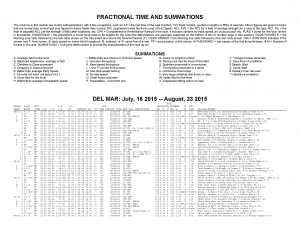 If you would like to try Race and Fractional Time Summations for free enter in promo code RACEFRACTFREE when creating a new account or logging into your existing account. LF= the last time of the Last Fraction. TV=Track Variant, quoted in lengths or fifths of seconds. Minus figures are given to tracks that are slower than normal and plus figures to tracks faster than normal. RCL AVE = the RCL for a field of average strength for a race of this type. RCL FIn = the final or adjusted RCL per the strength of field after scratches, etc. CPR = Comprehensive Performance Rating for the race. It includes variants for track speed, an unusual pace, etc. PURS = purse for the race, shown in thousands. CONDITIONS = the stipulations a horse must meet to be eligible for the race (the abbreviations are generally explained on the bottom of this or another page in this section). ODDS FAVORITE = the Morning Line odds followed by the last odds shown on the tote board and where the favorite finished (F). ODDS WINNER = the Morning line odds followed by the last odds shown. HW = HOW WON indicates if the winner was F: front runner, E: early speed-no worse third throughout, M: midpack, or R: came from the rear. PP = post position of the winner. IN-THE-MONEY = the names of the first three finishers. # IN = Number of horses in the race. A. Average field for the level I. Better-than-ave interior or mid-race speed Q. Queer or longshot winner Y. Younger horses dominate.